The ill-fated Fisker Karma hybrid car is getting a new lease on life, of sorts, resurrected under new ownership as the Karma Revero. The Revero is fundamentally the same as the old Fisker Karma but with minor updates from some new hardware and software. But an even smaller company in the world of electric cars claims that it’s actually responsible for this tech, that Karma obtained it in secret and cloned it. Following down a rabbit hole of lawsuits, forum posts and counter-suits, things only get messier from there. People who own limited-production, niche, and discontinued cars tend to form tight, supportive communities. In the community of Fisker Karma owners, a small company, PowerSource, was seen as an ally helping to keep the strikingly-designed hybrid cars relevant as they aged. You supported our car when others left her for dead. I hope you decide to stay with us. If owners of the distinctive and plucky hybrid car were happy to have a company help keep the machines alive, many were also happy when another company—Fisker’s new Chinese owners—came in to bring it all back from the dead entirely. This story is about these two companies, both of which have essentially the same goal: keeping the Fisker Karma relevant and alive. The two companies are attempting to go about this in dramatically different ways, but in the areas where their methods overlap, we encounter issues that foreshadow future conflicts among carmakers. What’s going on here is in part because electric cars of the future will increasingly be differentiated on the software they run as much as the mechanisms they’re made of. Software is infinitely reproducible, hidden, and can be stolen or copied without anyone noticing. That may or may not be what happened here; it almost doesn’t matter, because disputes like the one described here won’t be settled by this case’s outcome. In 2014, the mostly-defunct Fisker company was bought by China’s Wanxiang Group, and the name of the company was eventually changed to Karma. The car itself was updated very slightly and re-introduced to the market earlier this year as the Revero. The Revero bumped the price of the Fisker Karma up from $103,000 to $130,000 and included some minor updates, primarily to its electrical system and driving modes. Oh, and it now has hand-painted badges, too. Improving on those same things (the driving modes, not the badges) is what Southern California-based PowerSource has been doing for Karma owners for years, just in the aftermarket. PowerSource has been making an add-on module called TOM, or Transportation Optimization Module, designed to improve the performance of the Karma in multiple ways. It adds a new drive mode that allows electricity to be generated and stored for later, removes some restrictions on battery power levels to get more power out of the Sport mode, and lets the car get up to 45 miles extra from the all-electric EV mode. 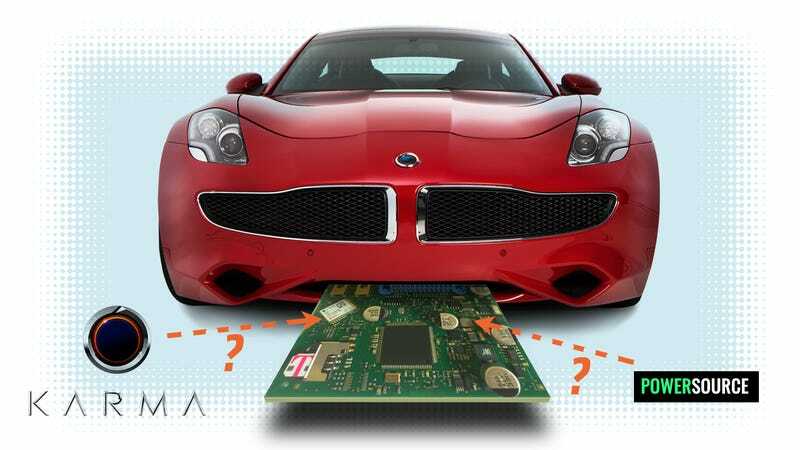 TOM is an add-on control board, a small, self-contained automotive computer that modifies the existing computer control system of the Fisker Karma. The company has achieved a good bit of notoriety in the Fisker Karma owner’s community, as they’re one of the very few companies producing products to keep the 2012 Fisker Karmas updated and relevant. On 500+ mile trips, effective mileage before TOM was in the mid-high 20's (no ability to plug in and recharge after first 50 mile charge used). After TOM installed, on 600+ mile trip my effective mileage increased to 34 mpg. I love my TOM and have had it for five months. The added features were a main determining factor in me keeping the vehicle. Kudos to PowerSource for giving us old skool Fisker Karma owners hope. I am very excited to see what these geniuses come up with next. PowerSource has been around since 2015 and the company primarily does prototyping and vehicle integration work for carmakers. The basic TOM unit is one of the components used for these purposes, and the application of the TOM to the Karma is essentially a side project for PowerSource. They’ve sold at least 80 units so far. Now, though, PowerSource believes that their proprietary technology—made to work with the original Fisker—has ended up effectively standard equipment on the new Revero without their permission. EV Mode: This mode allows 2012 Fisker Karma owners to sustain state of charge (45 miles and below) at any point during their drive. Think of this mode as the current Sport mode at 26/27 miles with the ability to hold all the way up to 45 ideal miles. ER Mode: This mode allows 2012 Fisker Karma owners to rebuild miles at any state of charge up to 45 miles. For example, if the owner has 10 ideal miles the PowerSource TOM unit will allow them to rebuild the pack over their drive to a maximum of 45 miles. This mode also allows the 2012 Fisker Karma to stationary charge at up to 11kW. For example, if you are running an errand, you can leave the car (outside), lock the vehicle, and then gain miles by leaving the vehicle on. Removes the artificial 180kW limit from the battery and allows the full 210kW of the battery pack to be accessed. This shaves about half a second from the 0-60 time, letting the car get to 60 mph in 7.2 seconds instead of 7.9. PowerSource is aware of this as well, and, based on emails from Karma obtained by a source within PowerSource, people within the company believe that Karma clandestinely obtained one of their TOM units and had it reverse-engineered so that they could integrate the TOM’s enhancements into their updated car. And for their part, a Karma executive who requested to not be named corroborates that they at least did obtain a TOM unit via “unofficial” means. What PowerSource is alleging is that Karma acquired one of their TOM units via the use of a “spy car” owned and operated by some third party, and had the car with the TOM unit installed sent to a firm for a full engineering evaluation, all without the knowledge or permission of PowerSource. Surprisingly, Karma doesn’t deny it, but things get murky from here on. Sources close to PowerSource have pointed to the Revero’s published specs that are remarkably close to what a TOM-modified Fisker Karma would produce as evidence that PowerSource’s designs and IP may have been reverse-engineered. At the same time, a Karma executive claims that it for all of its clandestine research into PowerSource, none of PowerSource’s tech made it into the Revero. I talked to people from both sides: a high-ranking executive at Karma who asked not to be named, and individuals close to PowerSource who have also requested anonymity out of concern of possible legal reprisals from Karma. And there are lawsuits pending from each side to the other, both filed in 2015. Though they’re not directly related to this situation, they contribute to a strained relationship between the two companies. It’s all a tricky story to unpack, but it’s a good guide for how understanding new challenges in designing increasingly digital cars. To be clear on what’s happening, let’s first cover what both sides seem to agree on. Back in September 2015, PowerSource and Karma were talking to each other about evaluating their TOM product, according to sources at both PowerSource and at Karma, and emails referencing these interactions have been provided by PowerSource. These emails regarding the signing of NDAs between PowerSource and Karma start in September of 2015, and continue through late October. As late as October 24, Karma’s responses suggest that signing PowerSource’s NDA was being considered. In the emails, there was talk of signing a non-disclosure agreement at PowerSource’s request, and de Vries was amenable, but in the end no NDA was signed. This has been confirmed both from emails provided by a source close to PowerSource, and verbally from a high-ranking executive at Karma. Emails show that initially, Karma agreed to sign an NDA and an end-user license agreement (EULA). This would have been PowerSource’s means of providing some legal protection of their intellectual property. But the deal fell through, and Karma declined to sign anything. This didn’t stop Karma from getting access to PowerSource’s hardware, though, as both sides admit. While the email correspondence stated that Karma wanted to keep PowerSource at “arms length” from Karma, and that Karma was “not interested in reverse engineering your solutions,” both sides corroborate that Karma as a company did clandestinely get access to a Fisker Karma equipped with the TOM unit, and that modified vehicle was sent to a third party company for a full evaluation at the behest and expense of Karma. The car with PowerSource’s hardware installed was sent to a separate company, Quantum Technologies, for evaluation this past March. Quantum has worked with Karma before, even back when they were still Fisker, as the developers of the software for the Fisker Karma’s ‘Q-Drive’ hybrid drivetrain system. Karma did not do any evaluation themselves, but Quantum does still have a close relationship with Karma (the existence of the relationship has been confirmed independently by the tech who worked on the evaluation, Craig Smugeresky, who spoke with me on the phone but declined to be directly quoted) and the result was a final report sent to Karma. “... [the report] goes into very specific detail about [the PowerSource] hardware and what it is doing and how it works (wiring diagrams, schematics, specific messages, software etc). There are new features that were added to the car that [PowerSource] built into one of [their] products. The Karma executive we spoke with confirmed to Jalopnik everything described here—that Karma’s NDA negotiations with PowerSource fell through, that Karma paid for a private owner’s car to secretly acquire the TOM device, that Karma paid for a subsequent evaluation of the device by a third party company and that Karma got that third-party evaluation. Design Freeze was October 22, 2015. The third party assessment spelled out that this is an aftermarket device which is grafted onto the MY12 Fisker Karma messaging system. The design freeze date precedes the third party assessment by several months. Let me make a few important points. The TOM unit was never in the hands of any Karma employee. There was no change to our Product program as a result of any of the test results. There has been no use of any TOM unit technology in the Karma Revero. I’ve requested corroborating and dated documents that confirm the Revero’s design specs—especially the specs that seem similar to the enhancements the TOM offers—were frozen before the spy car was sent to Quantum for evaluation. The Karma executive has not responded to these requests for corroborating documentation, but I’ll update the story if this person comes through. Confusing the whole matter are a pair of lawsuits between the two companies. Karma is suing PowerSource, alleging that the TOM unit is only able to do what it does because of illegally-obtained information and code from Fisker. Sources inside PowerSource suggest that this lawsuit is just an act of retaliation. Ashwin Balan, one of the founders of PowerSource, sued Karma over a breach of contract. This lawsuit has since been settled, with Balan claiming that Karma paid out $789,000 in “judgement and legal fees” to settle in mid-May. This is all to say that the relationship between Karma Automotive and PowerSource is not exactly calm, nor is it restricted to just questions about the spy car. So what should you make of all this? I’m not exactly sure. The smaller company sure had tech that sounds like what’s in the Karma Revero, and the most I can say about Karma for certain is that I think they’re disingenuous regarding how they describe their solar charging roof. Car companies routinely do test and benchmark one another’s products, and that alone could also be what’s going on here. The more important software becomes in cars, the more likely we can see things like this happen. If one company copies, say, a steering rack design, anyone could look at it and tell. If code is copied, or modified even, this all goes to show how hard it is to pin down. As car technology veers further and further into these new realms of all-electric drive, social-linked infotainment and full-on autonomy, only expect to find more stories like this one.